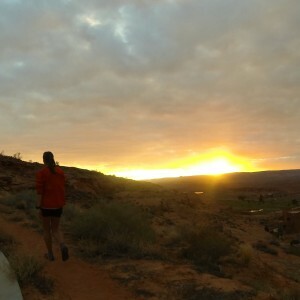 When I first heard about this race was on my first trip to run The Wedge Overlook in the San Rafael Swell with a group of Wranglers who were mostly still strangers to me. Somewhere around mile 13, over my shoulder I heard Jennilynn shout, “Hey Jenna, are you gonna come to Antelope Canyon in February? It’s gonna be a party!” Hmm. I thought, “I’m sure I could do another 50K by then, seems reasonable.” Plus, I’m a sucker for a race weekend out of town somewhere scenic with awesome people. Sure, count me in! 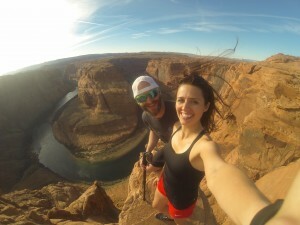 When we got home from the trip, I hopped on grandcircletrails.com to research the race, but quickly found that some of the best scenery wasn’t included in the 50K course, and I’d have to do the 50-miler if I wanted to see some of the more amazing slot canyons. I texted Craig about my dilemma, who characteristically said, “Oh you could totally do 50 miles by then. Just sign up for the 50. You can totally do that.” Uh.. yeah, but.. training. And I’m a wuss. And I’m new at this. And I just barely did a 50K. Which took me forever. And also, winter.. Seriously? Naturally, Craig just said, “You’ll be fine.” I said, “Okay, but you’re responsible for making sure I’m ready.” Haha, oh man, little did I know.. Train entirely outdoors, which I accomplished with the exception of a single 4-mile treadmill run for sanity’s sake. To not have a specific time goal, but to cross the finish line feeling good mentally no matter what my body was doing or feeling, and just be excited at the accomplishment. To let myself cry if a moment called for it. That last one probably sounds a little strange to have as a legitimate goal, but I’m not someone who cries. It’s a thing, and not a thing I do. Almost ever. I lean more on the side of emotional constipation in life when it comes to expression of vulnerable emotions, something I’ve struggled with for years. As simple as it sounds, I quite literally had to train mentally for allowing myself to cry, very much like I had to train for the mental challenge of the distance itself. That proved to be a worthy challenge of its own. Let me make one thing clear. I am not, I repeat NOT a jolly winter runner. I don’t enjoy knee-deep post-holing, I don’t get a kick out of seeing just what crazy conditions I can get away with wearing shorts in, and I definitely do not love freezing, snowy, windy running for 3-6 hrs at a time. Nope. I am 100% a summer runner. I absolutely adore dry, breezy trails and especially summits. Give me dusty, dry, burning hot trails over the snow any day. The most running I ever did outdoors in actual winter conditions during an entire winter season before this was maybe a grand total of 20 miles combined from November to February. 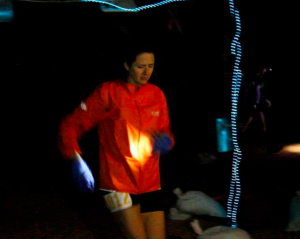 So the sinking feeling in my gut when I signed up for the AC50 was knowing I would be training for my longest race ever, but outdoors, on trails and peaks (which were still reasonably new to me) in snowy, cold, and often dark conditions. All of which are conditions I absolutely despised up to this point. It’s not an understatement when I said I was a wuss about winter. Legit. And this was also my first time not basically just skipping over winter entirely with my training. I did my best to set aside how much I despise winter and tried to learn to appreciate it however I could. 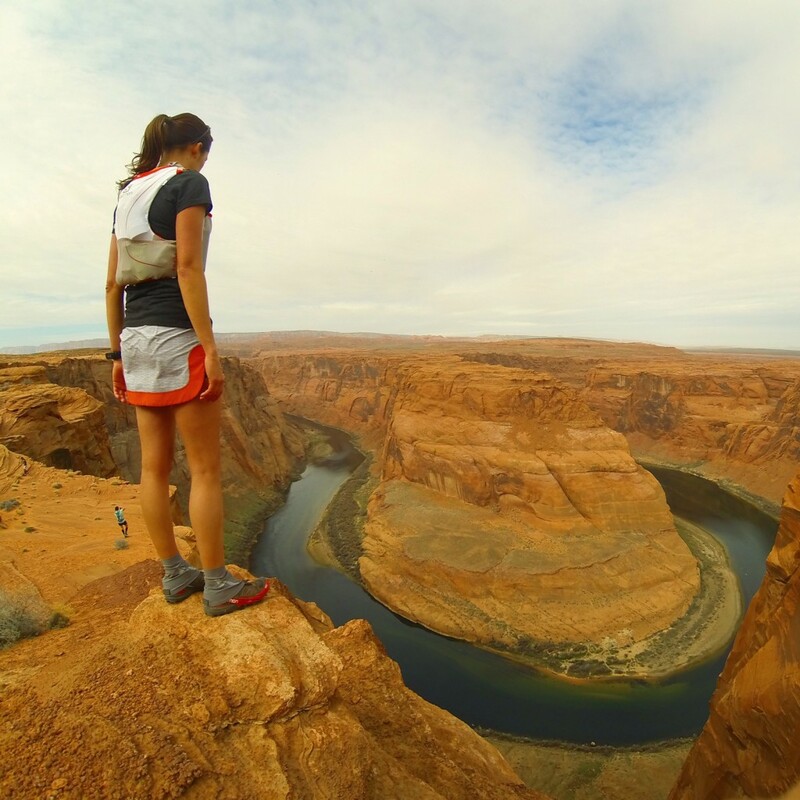 I joined in for as many group runs or hikes as I could handle and tried to just dive in. I had a number of eye-opening learning experiences about winter running in the Wasatch, including a whole slew of epic fails at attempting trails I shouldn’t during snow storms (yeah, waist-deep snow more than once), fumbling around with gear trying to figure out what worked for me to not freeze my freaking feet off, and learning just exactly what you’re in for when Kendall Wimmer invites you on “a little stroll up Mahogany” (ha.. ha ha.. yeah..), and ultimately learned how to dress properly for the conditions so that I could play around and have fun. What I didn’t realize at the time was that slogging it out for long miles through the winter and diving into the tough training in harsh conditions would bring with it a mental toughness I’ve never had before. Toughness that shows up unexpectedly in conditions other than snow. Like sand, for example. The entire weekend was non-stop awesome. 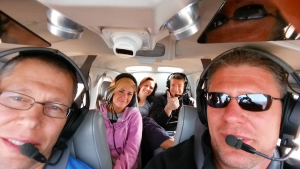 I had the privilege of flying down in a private plane with several close friends who were running the 50 as well as my pacer, Ashley. 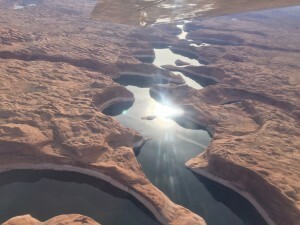 The flight over Lake Powell was incredible and set a tone of adventure and wonder for the weekend. We met up with a bunch of Wranglers and played around for most of Friday night, including some cliff-edge frolicking at Horseshoe Bend..
..dangerously large portions of incredible Mexican food..
..and, of course, as many of us as possible converging on a single hot tub before heading to bed. Race morning didn’t come with the usual nerves I’m accustomed to from road running. I felt calm and mostly collected. Despite this calm, however, I still somehow ended up in the eco-potty when the race actually started, and had to scramble out to jump in at the back of the pack. I fumbled around with my headlamp while trying to navigate through the crowd, and managed to catch up with a couple of friends around mile 4. 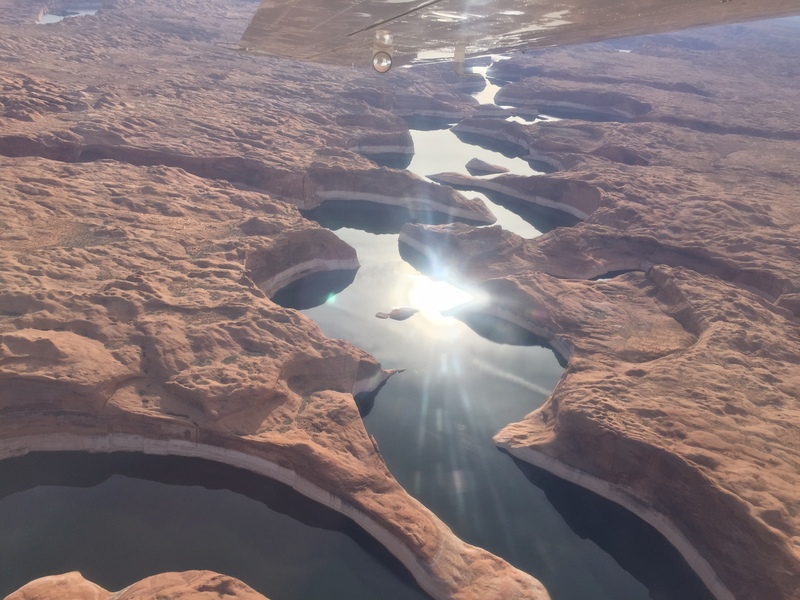 Running through Lower Antelope Canyon, around Horseshoe Bend, and through Waterholes Canyon was so incredible and it did a great job of distracting me from the miles and miles between those areas of trudging through just endless deep sand. I ended up running most of the middle miles of the race solo and chatting with random runners along the way. 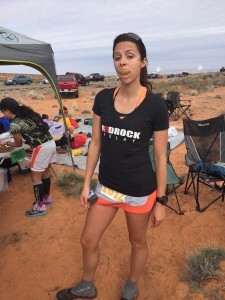 One runner out of the blue said, “Are you a Wrangler?” which got me laughing and we ended up talking about the Wrangler crew for a few miles before we hit the Waterholes slot canyons. 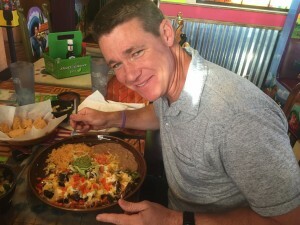 The race went pretty well for me in general, but it’s clear I have a lot to learn about nutrition. I did a lot more walking than expected in the second half as I fumbled through cycles of depletion and rebound. I’m probably just still learning the right balance of sugar vs salt. I will say this, I’ve never had such an intense appreciation for boiled potatoes and pickle juice. Even now after the race, I find myself with a deep, abiding love for them. 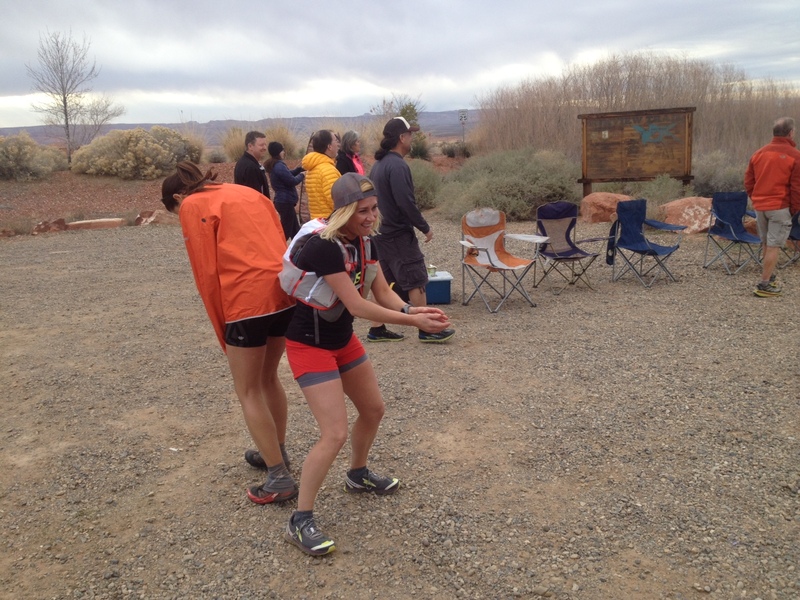 With about 18 miles left, my pacer, Ashley, jumped in with me. I was thrilled to have the company of someone I had spent so many miles running and laughing and dorking around with during the hard winter months. 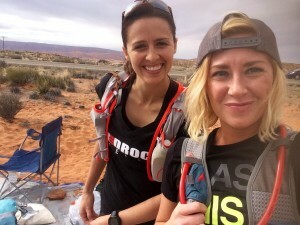 Things went pretty smoothly until we hit the Page Rim Trail where I started to slow down and really feel the fatigue from running through 40 difficult miles of sand and rough slick rock terrain. Ashley was a fantastic pacer and kept my spirits up like a champ. Right around mile 45 I had my first experience with a ‘late-stage rebound’. By mile 43, my “old man form” as Ashley called it was in full force as I wobble-hobbled up to the Lake Powell aid station. 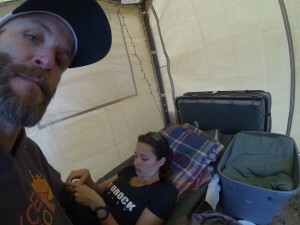 I laid down on the cot in the tent to put my swollen, tender feet up for a minute. I was pretty far into my own head picking at pickle seeds in the bottom of a tiny paper cup when Craig walked in to give me a jacket and a pep talk. Craig had already finished at least 3 hours earlier, but had stayed at the finish line to cheer friends in. 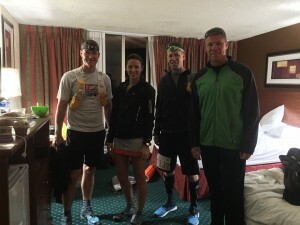 As he talked me back to reality, he told me that all of my friends were there, and that no one was going anywhere until I finished, something that didn’t fully sink in until about mile 45. It took a little work, including a bit of a booty quake, but Craig and Ashley got me back on my feet and ready to go and we headed out to do the last 7 miles. I was struggling a little bit mentally to keep my resolve and to push myself, so I turned a little music on that played out the speaker on my phone. I tucked it into my pack and pushed myself to “walk faster”. As I talked myself through the various forms of pain and the number of miles left compared to the pace I was keeping just walking, and thought about the amount of time people had spent waiting for me at the finish line already, I stopped for a minute, and as if I had no capacity for “inside voice” shouted, “Really? !” Ashley turned around and said, “What?” Again I shouted, “REALLY?? !” She said, “What’s wrong?” I said, “I have all of these incredible people incredible waiting for me at the finish line, and THIS is all the motivation I have left? REALLY? ?” I got a massive rush of adrenaline at the thought of it and suddenly broke into a run. The combination of the mental and physical momentum really overtook me and I ran the next mile at about a 9:00 pace and felt better than I had in 20 miles. The high wore off after about a mile (figures), and I slowed to a walk again. I found myself back in my head and thinking about all of the experiences I had had leading up to that moment, and the finish line ahead of me. I thought about the many, many years of struggle that were behind me, the many dark times that seemed to linger relentlessly and just recently have finally abated, and how drastically that had all changed in August when I dove into trail running and started meeting so many wonderful people who brought with them so many incredible experiences. As my body was hitting a wall I had never experienced before and that I had been training to push through, I simultaneously hit the emotional wall I had also been training for. It started with the music playing out of my little phone speaker. The words of the song that was playing started the tumbling of the rocks off the top of the emotional wall I’ve spent years building and patching. I immediately crumbled. I stopped and leaned over with my hands on my knees and in an instant was sobbing. Ashley ran up to me and said, “What’s wrong?” I struggled to get words out through the sobbing, but what came out was, “It just was so hard for so long.” She said, thinking I meant the race, “I know, sweetie, but you’re almost there.” I said, “No, my life. And since I met all of you, it’s been nothing but wonderful. 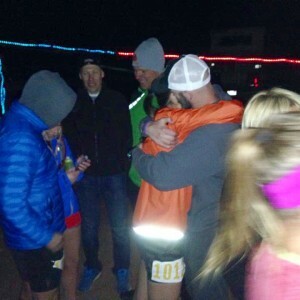 It’s finally just so good and I’m just so grateful.” I sobbed for a good minute or two, not realizing the full impact that moment and everything behind it truly had on me emotionally, before collecting myself and settling in again for the last few miles. I had a few minutes of admiring an incredible sunset before it got dark and the air turned chilly. I pulled on the blue gloves Craig had stuffed into my hydration pack despite me saying I wouldn’t need them (clever), and struggled to carry a borrowed headlamp, because I lacked the energy to actually put it on my head. We stumbled down the last cliff off the Page Rim Trail where we met up with Ben who was there volunteering. As I was walking toward the ramp that dropped around the corner to the finish line, he said, “All your friends are there waiting. Are you really gonna walk it? Go get it!” My body screamed otherwise, but I pushed myself into a run (a term I use very loosely). As I came around the corner and looked down onto the finish line, I couldn’t make out specific people in the dark, but I could hear their voices calling and cheering. I remember it being so much louder than I expected, and the positive weight of the support from each of them propelled me over the finish line. As I crossed, I could immediately feel another wave of immense gratitude welling up behind my eyes and the happiest lump I’ve ever had in my throat. I stumbled blindly toward the group for a second before Steve stepped out and caught me. I couldn’t see faces, I couldn’t tell who was who or who it even was that caught me for a few seconds, and once it registered that literally every friend I had at the race that weekend had stayed and waited for me, I buried my face and sobbed. I was completely overwhelmed by the experience and the incredible support of each of those people, all of whom had run their own tough 50 miles, who waited literally hours after finishing, when they could have left and showered and eaten and come back, when they could have been somewhere far more comfortable, simply because they find joy in supporting others and wanted to be there to see me cross that finish line. The support from each person in that moment and the role each one of them has played along the way, the moments I have had with each of them and how significant each has been to me – whether they’re aware of it or not – combined with the empowerment and pain of the accomplishment was one of the most overwhelmingly positive experiences of my life, and for the first time in years, I let myself be completely immersed in and vulnerable to that moment. It’s difficult to put into words how significant each person has been to me, and it feels inadequately general to say “they’re like family”, but they truly are. The entire race experience, the staff, the course, the tone of the race, the volunteers, the community involvement, and the support and love from my friends and family, everything about this race was wonderful. 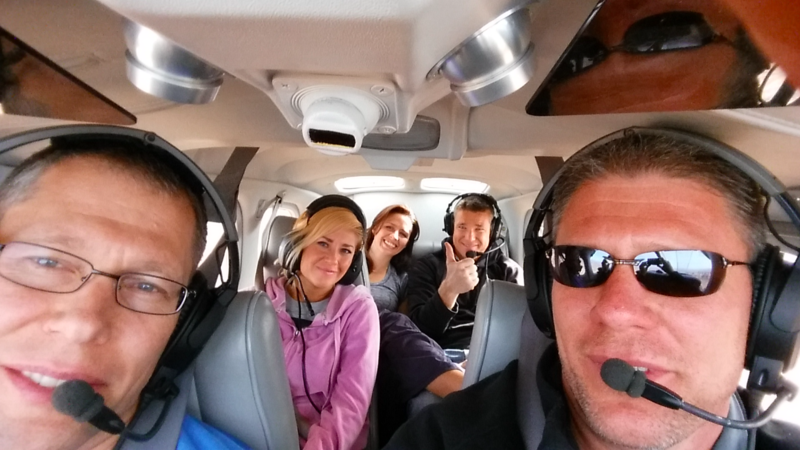 It was a positively life-altering experience, one that will stay with me forever. P.S. Now I’m a total crybaby. Great. Thanks, guys. What a tribute to your friends and the ultra running community! Doing something beyond what you thought you could do is sobering and humbling…there’s nothing wrong with becoming a crybaby. I’m so proud of you, Miss J! Great race. Great report. Congrats! 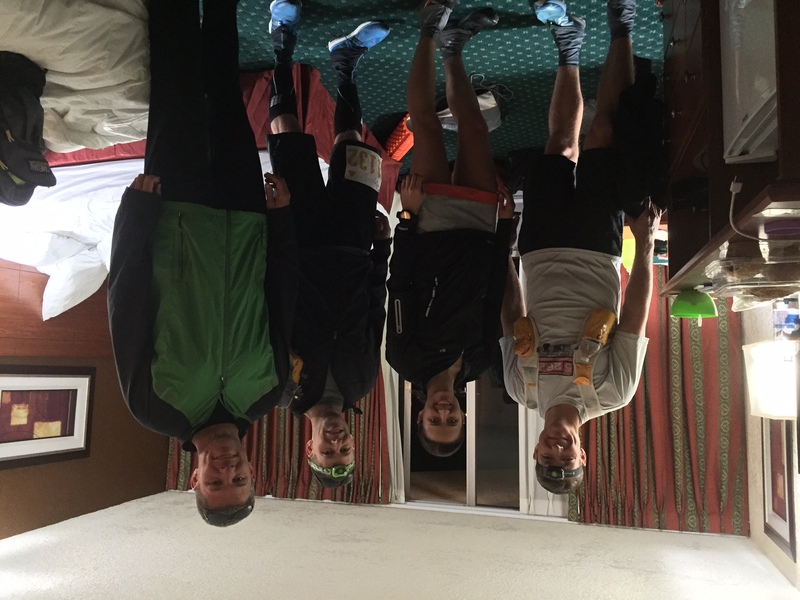 Awesome report Jenna, so happy to have been able to share in a small part of this with you and witness your resolve on this race….awesome sauce!